Laguna Reef Ground Floor Condo With Water View! 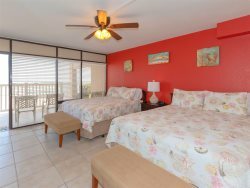 Aransas Bay Getaways is a cute 1 bedroom downstairs unit with breathtaking water views in the newly remodeled Laguna Reef Condominiums. Relax in the hot tub overlooking Aransas Bay or cool off in the Laguna Reef swimming pool. Spend your evenings fishing from the 1000 foot lighted fishing pier and grill up your best catch at one of the outdoor grilling areas. This beautiful condo has a king size bed in the master bedroom and a sleeper sofa in the living room to comfortably sleep up to 4 people. The kitchen is fully stocked with all utensils included. The living room has a flat screen TV with Spectrum Cable and spectacular views of Aransas Bay. The bathroom has a tub/shower combination. This unit also has wifi and is pet friendly! All linens and towels will be provided to you for your convenience. Amenities at the Laguna Reef facility include a swimming pool, hot tub, 1000 ft. fishing pier with fishing lights, several shared charcoal grills, beautiful lagoon area at the water, and a large parking lot with plenty of space. Aransas Bay Getaway is located near the Rockport Heritage District and Rockport Beach. Spend a day in the sun at the Rockport Beach where you can rent jet skis, swim with the kids, or grill up some food at one of the picnic areas. The Rockport Beach also allows fishing and is only five dollars for a day pass or 20 dollars for a year pass. There are two piers at the Rockport Beach, the south pier is free and the north pier has a beach admission fee. There is also a boat ramp. We have a list of fishing guides on our site as well.